After the Mormon Church released its membership statistics in April (2013), Mike at RoundelMike.com, a self-proclaimed “stats geek,” analyzed the church’s self-reported membership data from 1970 to the present. Replete with charts and graphs, it is a fascinating look at Mormon Church growth over these 40-plus years. Please take the time to read Mike’s report if you can. For those who choose not to, here is a brief summary of what his report includes. Mike first graphed total membership, noting that there has been strong growth over the years. “The LDS Church grew from about 3 million members in 1970 to about 15 million in 2012, which means it grew five times larger in a little more than 40 years,” Mike wrote. The next graph is total yearly convert baptisms (without considering retention information). “Since 1990 the trend has generally tapered downward with an obvious low spot in the mid-2000s. It has somewhat recovered in the past few years, but the current number of annual baptisms still falls short of the rates seen during the 1990s,” Mike explained. Mike included a couple of graphs dealing with children of record and 8-year-old baptisms, but the church’s reporting of those statistics has been inconsistent so it’s hard to understand what the numbers mean. Mike wrote, “It’s anyone’s guess as to what’s going on.” But one thing is clear: though the trend is slowing, the Mormon Church continues to experience “robust” growth according to its self-reported statistics (which do not differentiate between active and inactive members). This doesn’t mean, as many Mormons like to think, that the Mormon Church is “the only true and living church upon the face to the whole earth” with which God is “well-pleased” (D&C 1:30). Rather, it is a call for those who belong to Jesus to continue to “fight the good fight of faith,” “guard the deposit entrusted to you,” and patiently correct those in opposition to God’s truth (1 Timothy 6:12, 20; 2 Timothy 2: 24-25). It is a call for us to stay on our knees, pleading with God for His mercy toward the Mormon people, that 2 Timothy 2:25-26 may become their story. May it be so, Lord Jesus. 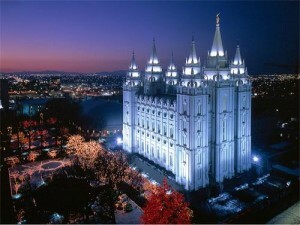 Mormonism’s growth figures—what can you believe? This entry was posted in Friendship, Interaction, and Evangelism, LDS Church and tagged Mormon Church growth, Mormon Church Membership, Mormonism, Mormons. Bookmark the permalink. This is a false syllogism. Revelation from Heavenly Father is not based on emotionalism. Revelation from Heavenly Father is not based on emotionalism. How then do you know that you have received actual revelation? How can you be sure that what you “received” is not from a demonic or human source? MJP: I guess I misunderstood what you want. You asked if I learned about Christianity just to learn about Christianity and I said yes. You asked which books, and I did not mention any specific title or author because I can’t remember which titles and authors. I have read many over the years, and am currently doing so. To be honest my memory is not great anymore due to medications. I am not trying to avoid any question or avoid answering anything. And I do talk to people. I have friends of many faiths. I have relatives of many faiths. And I read religious sites on the Internet. A while back I did ask an honest question and Falcon had to give one of his smart alek replies without answering, and no one else answered. So if you want the names of specific books then you will have to give me some time to go to the library so I can write the information down to give it to you. I used to be able to access a large city library and a university library. I do not have that kind of access now. The library where I live is small. I do not pray about everything I read about or learn about or try to learn about. I was taught to look at all sides of an issue, think about it, examine it, look at it from different angles, regardless of the subject matter. MJP you also said: Reading anything without knowing what it is is not a very good way to learn. I really do not know what you mean or are getting at with this statement. Please explain. Falcon: Once again, you are all over the place with your comments. And don’t worry, I don’t take offense to any accusations or straight forward comments, but it is impossible to delve into a topic if your bouncing around all over the place. If there is something specific you want me to respond to just let me know, but there is no way I can respond to every one of your accusations and assumptions. I simply don’t have the time. If one reads the Bible from front to back there is a theme that is repeated over and over again. The theme is Put you Trust in God. I think we all could cite at least a few scriptures from both the Old and New testament where this lesson is given. If you believe the Bible then you should believe this counsel. I certainly don’t expect you to list every single book you have read, but you would hopefully agree that just reading books to read books is not a good way to research anything. Research requires a purpose, plan, and a direction. I would classify learning about a faith as research. Unfortunately, Christianity has a huge, unmanageable amount of books dedicated to it. Some are worthwhile, most are not. There are books about its history. There are books about the Reformation. There are books about historical Christian figures. There are books about theology. There are books about books in the Bible. There are critical books. There are comparative books. There are books and books and books about Christianity. Not all are valuable to research what our faith actually stands for. The topic covered is important, and so is the author. A John McArther, Charles Stanley, or Billy Graham are good authors. I would avoid the likes of Benny Hinn or Joel Osteen. You are familiar with CS Lewis, I am sure, but you may not be familiar with GK Chesterton, St. Augustine, Wesley, Spurgeon, Oswald Chambers, Ravi Zacharias, and more. Just as you would tell me to avoid certain authors to learn about Mormonism, I tell you the same is true with my faith. The source is important. But blindly saying you read a lot, and prefer reading rather than talking, is meaningless. You then say this: “I do not pray about everything I read about or learn about or try to learn about. I was taught to look at all sides of an issue, think about it, examine it, look at it from different angles, regardless of the subject matter.” How is it then that you confirmed your faith in Mormonism? Missionaries teach people to read specific passages, pray about them, and wait for confirmation by way of a burning in their bosom. I’m not sure that’s looking at all sides, thinking about it, nor examining it from different angles. Indeed, we are to trust in God, aren’t we? That’s not in question, though, is it? If one reads the Bible from front to back there is a theme that is repeated over and over again. The theme is Put you Trust in God. The question is how do you determine that the “spirit” you are hearing is from God and not from a demonic or human source. The Lord in the Bible commands us to test the spirits and as I pointed out earlier it gives at least two specific ways to do so. If you trust God you should obey his commandments and test the Spirits. Do what Jesus says (including testing the spirits) and you will know the truth. Don’t however expect him to revel the truth to you if you are unwilling to do what he clearly says to do.